While the protocols for method validation of quantitative assays are well-established, the studies required for qualitative assays are less well understood. Dr. Paulo Pereira, our new contributing editor, provides a needed overview of the validation requirements for qualitative tests. Are we positive (or negative) that we know how to validate a qualitative method? For those who weren't able to attend the Westgard and Westgard workshop at the AACC/ASCLS convention in Philadelphia, the video is now on YouTube. Here's your chance to see how many jokes my father can make at my expense. Is it ever possible that your father will stop embarrassing you in public? So far I can only answer "NO"
A Sigma-metric analysis of an AU 5800. 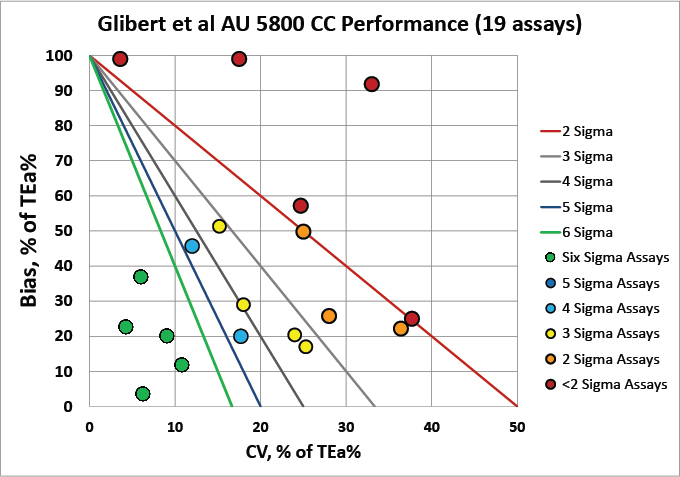 Earlier this year, a Belgian laboratory performed a series of validation studies for the analytical performance verification of a Beckman Coulter AU 5800. The additional twist is that it compared two distinctly different instruments from the same vendor, an AU 5800 and a DxC Unicel. Does buying all your instruments from the same manufacturer always guarantee the comparability of results? 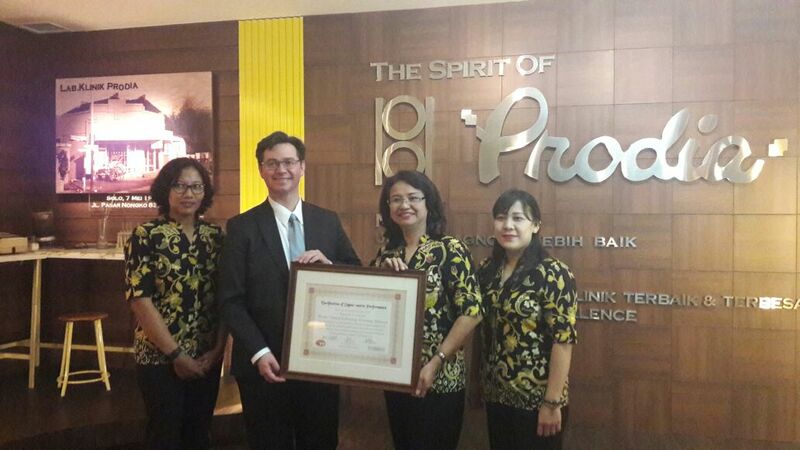 The first laboratories in Indonesia - three of them, in fact - achieved Sigma Verification of their chemistry performance in November. 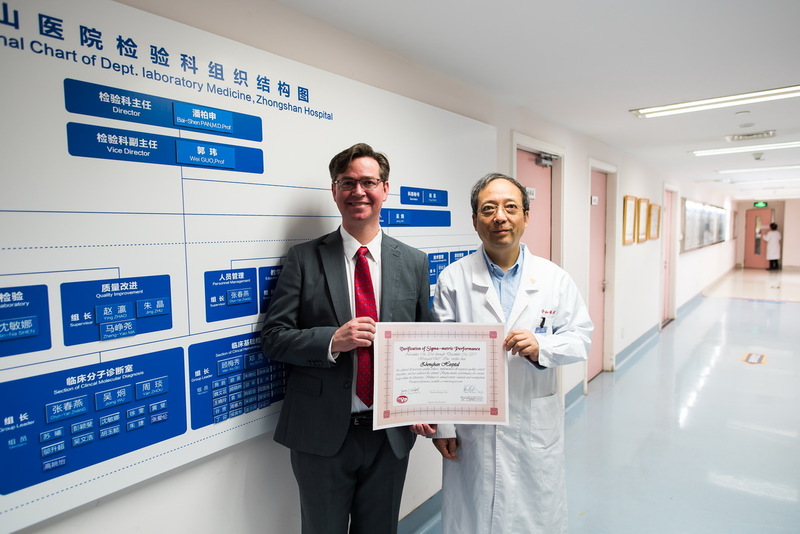 In November, the first hospital in Shanghai, Zhongshan Hospital, was able to receive the Verification of their Sigma performance, guided by the assistance of our local partner, QuaLab. In November, while I was visiting Shanghai, I had the pleasure of talking to the 3rd year students of medical biochemistry at Jiao Tong University. These were students who had not yet started their first placement in a laboratory. So they were innocent and pure, untainted by the poor practices that are often taught to new employees by the previous generation of technologists. It's rare that I get this chance to help students learn the right practices from the very start, rather than try to get them to un-learn a set of bad habits. I'm sure it was a bit of a strange experience for the students, having a strange American with a last name they've read about in their textbooks, telling them an entirely different story about what happens in the laboratory. But I appreciated their willingness to hear me talk about the practical challenges that lie ahead of them. Special thanks to Director Ni, who not only helped arranged the guest lecture, but also gave me an Honorary Visiting Professor award. I hope I gave the students some useful advice about their future careers. Thank you again, Jiao Tong University. A new Sigma-metric software program! As much as people enjoy using our free downloadable spreadsheets to calculate Sigma-metrics and generate Sigma Method Decision Charts, there is a better way. Rather than enter everything by hand, you could have a software program automatically gather the data and do the calculation work for you. Now, in the same program that you handle your QC and your peer group comparison, you can view your Sigma-metrics. It's taken a long time to get these tools into software, we're delighted that vendors (other than us) are adding these features to their offerings. Again, to see more about the Sigma-metric offerings from LabLink xL, visit their website.